“Take medlars that are rotten, strain them, and set them on a chaffing dish of coals, season them with sugar, cinamon, and ginger, put some yolks of eggs to them, let it boil a little, and lay it in a cut tart. Being baked, scrape on sugar.” The Accomplisht Cook, Robert May, 1660/1665. Rotten medlars. Doesn’t sound very inviting, does it? And the old country name for these fruits was ‘open arse’, which while descriptive, is equally unappealing. It took me a long time to reconcile myself to medlars. 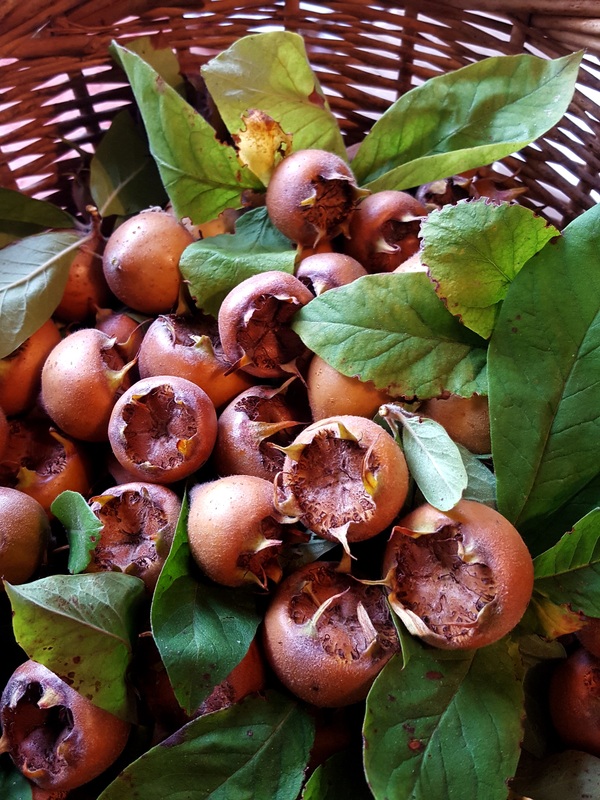 While you can make a medlar jelly from the freshly picked fruit, it’s traditional to ‘blet’ them so that they soften and the flesh begins to break down. My father-in-law used to make a jelly from very well bletted medlars which had, to my palate, a really funky, rotten taste. I’ve since discovered that you can blet them without taking them to such extremes. I put mine in a single layer in a wooden rack or basket somewhere cold and wait until they’ve softened and wrinkled, but rescue them before they get really manky. I suppose, like hanging pheasants, it’s a matter of taste as to how far you take them. A medlar is a very pretty tree when it’s in blossom but apart from making jelly there aren’t vast numbers of recipes for its fruit. One exception is Robert May’s, quoted above. May was a Restoration cook and his book made early use of two ingredients brought to Europe from the Americas, turkey and potatoes. I’m struck though by the similarity of his recipe to that US Thanksgiving classic, the pumpkin pie. I wonder if a version of the medlar tart crossed the Atlantic with early settlers and they adapted it to what was available locally? My interpretation of May’s recipe reflects this. While medlars, bletted or otherwise, aren’t commonly available unless you know someone with a tree, this is a lovely autumn dessert and well worth a go if you can source some. 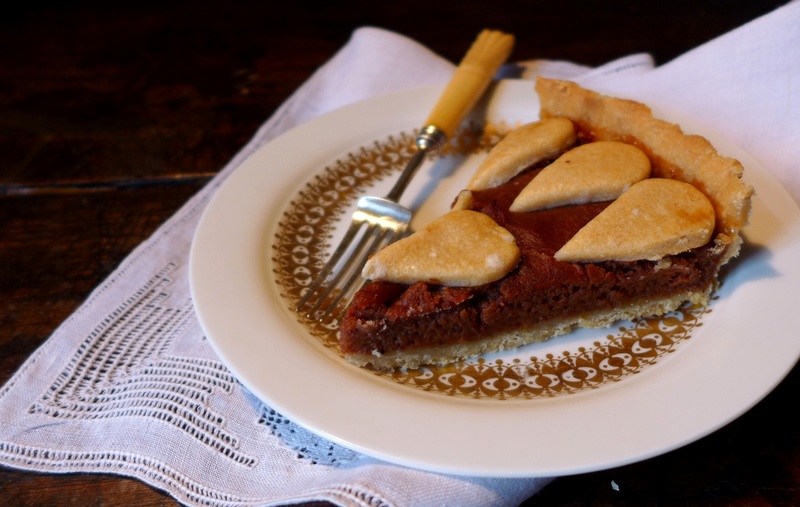 It has a similar texture to pumpkin pie, but it’s fresher and fruitier. I love it. Prepping the bletted medlars is a bit fiddly and time-consuming so best done ahead of time. 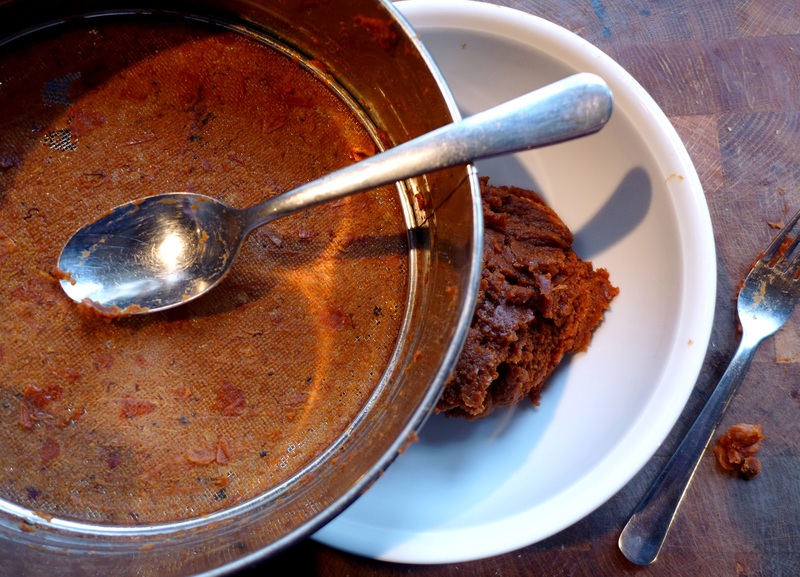 Remove the skins and pips and push the resulting glop through a sieve so you have a smooth puree. Mix in the spices and set aside. To make the pastry, either put the flour, salt and fats into a food processor and whizz until the mix resembles breadcrumbs or rub the fat into the flour with your fingertips until you reach the same point. Add the beaten egg and cut it through until the pastry forms a ball and leaves the sides of the bowl clean. If it’s too crumbly, add the cold water, a tablespoon at a time, until it comes together. Roll out around two-thirds of the pastry to line a greased, loose-bottomed 22cm flan tin, allowing a slight overhang. Chill in the fridge for 30 minutes. Use the remaining pastry to decorate the tart. 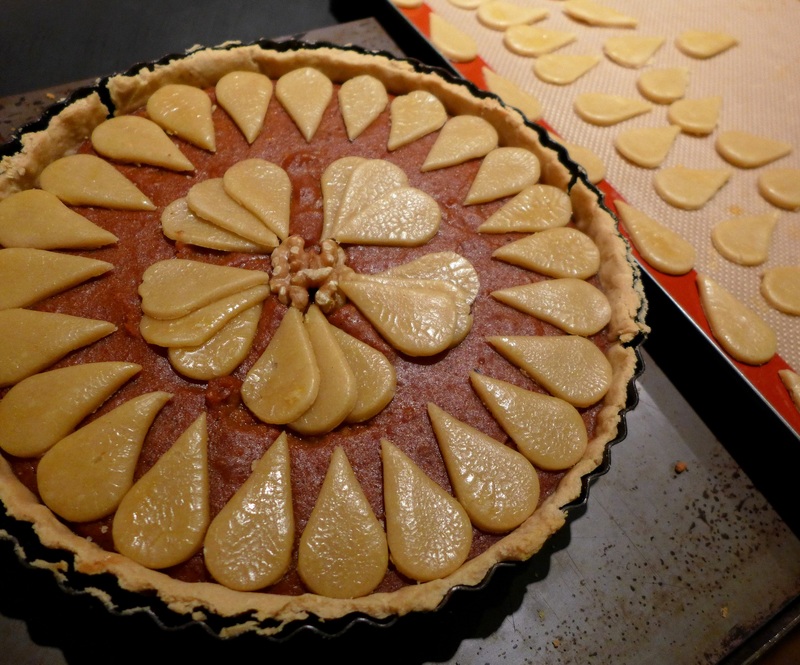 I checked with historical baking maestra Regula Ysewijn (if you haven’t already got her book Pride and Pudding, put it on your Christmas list) and a ‘cut tart’ as described by Robert May means one with a design, such as a lattice top. I baulked at trying to make a lattice on a half-baked pie so opted for a simple pattern, see pics. It’s a good idea to egg wash your decorations before trying to apply them to the tart. Once made, put them in the fridge until later. Line the tart with foil, overlapping the edges of the pastry, and fill with baking beans. Blind bake for 15 minutes, then remove the foil and beans. Brush the base with a little beaten egg and bake for another 5-10 minutes. Remove from the oven and set aside. 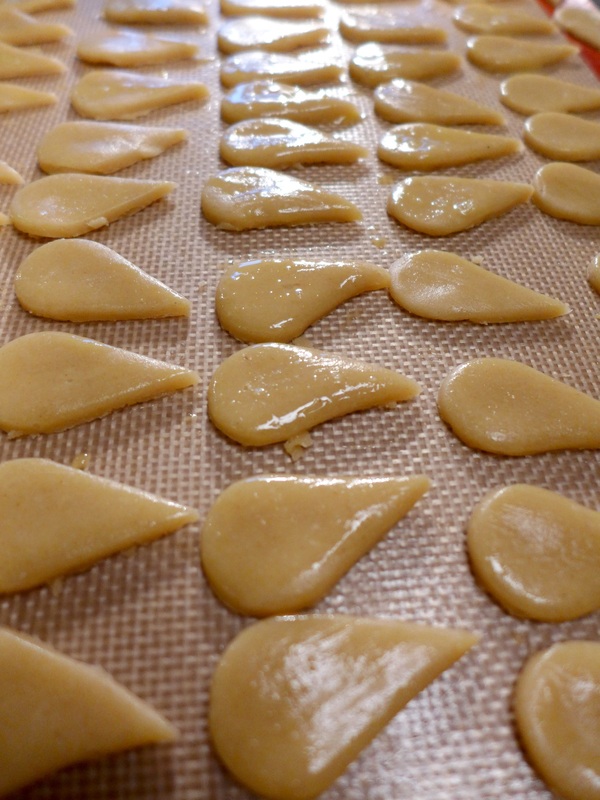 Once it has cooled, trim the edges with a sharp knife so they’re level with the top of the tin. Turn the oven down to 375F/190C/Gas Mark 5. To make the filling, whisk together the sugar, fruit juices and honey until smooth. Add the zests and beaten eggs, then mix in the medlar puree and beat with a wooden spoon until smooth. Pour it into the tart base and cook for around 25 minutes until the filling is partly set, then remove the tart from the oven and apply your trimmings. Put it back in for another 30-35 minutes, or until the pastry decorations are cooked and golden and a skewer inserted into the filling comes out clean. Allow to cool in the tin for 10-15 minutes before removing to a serving plate. I like to serve a bowl of tart creme fraiche alongside. 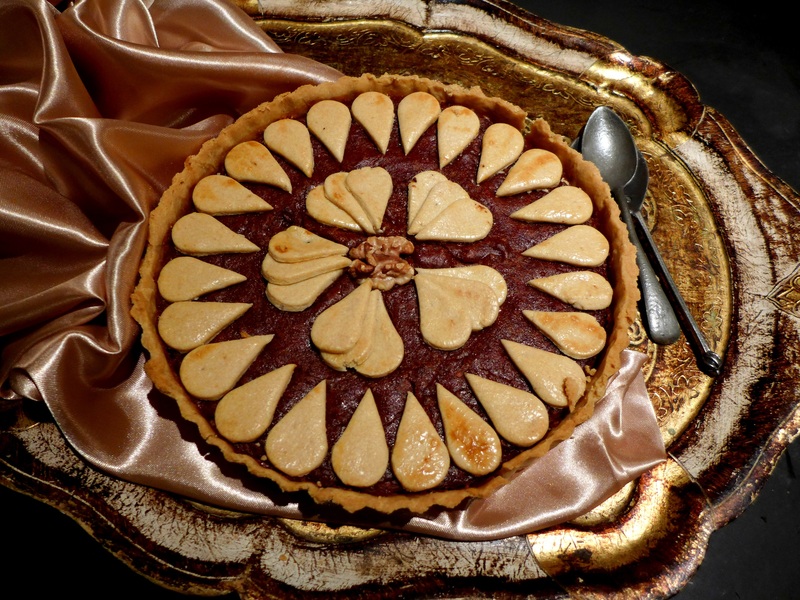 This entry was posted in Desserts, cakes and biscuits, Fruit, In the garden and tagged autumn recipes, historical recipes, medlar tart, medlars, Robert May, The Accomplisht Cook by Linda Duffin. Bookmark the permalink. I clearly never got the hang of bletting them. They were two a penny in France, but I never produced a result that wasn’t, well, frankly nasty. I know the loss was mine, because obviously people in the know appreciate them. I can’t find any in England, not here anyway, so it’s too late now. That’s a shame, they’re still on sale here, although I know they are hard to find. On sale? Never seen that anywhere, even in France. For sale, I should have said. What a pity! You’ll have to come back to Suffolk next year and we can experiment, Stefano! That cheers me up. I always feel the Italians and the French are better than us at this kind of thing. Good to have a recipe for medlars! I love pumpkin pie so looking forward to the British version. Linda, you’ve gone and taught me a new one, again. I’ve never tasted medlar, but see where the old name comes from. You’re very correct about the similarities to the American pumpkin pie. But it makes sense, that the English settlers knew how to make a medlar tart but had no medlar in the New World. Enter the pumpkin. I love food stories like this. Thanks for a great informative post. Linda, I had never heard of the medlar – either tree or fruit – before reading this! Thanks! So interesting! I don’t think I’ve ever seen, but I gather from Googling that they would grow here. I think I need to plant a tree … that is, if I can find one and then if I can get it to grow without the deer mowing it down.